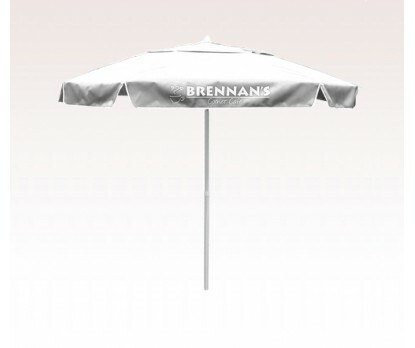 Personalized white 84”arc wind proof patio umbrella make an excellent marketing tool for businesses, which wish to offer a good relaxation space for beach visitors. 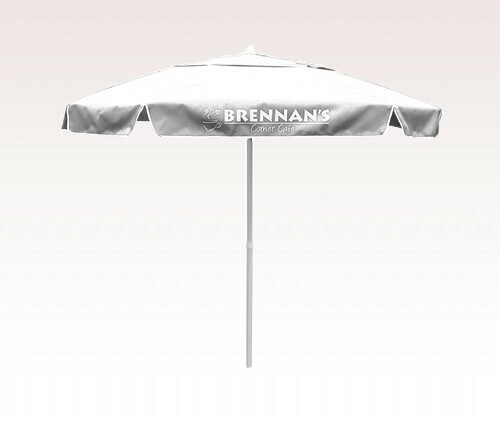 We supply this umbrella to businesses operating by beachfront. People get easily drawn to this umbrella due to its pure and pristine canopy. Marketers love it because it offers them enough space to express their business information. Features - sturdy double hook frame system with air vents, 8 panel configuration, covers up to 36 inch patio table, 1.5 inch diameter pole, a 84 arc diameter white canopy supported by a oversized steel frame. Imprint Area - 15"W x 14"H on one panel, 25"W x 3.5"H on bottom flap. Available Colors : Black, Forest Green, Navy Blue, Red, Royal Blue, White, Yellow. Product Size : 53" x 11" x 10"